Our robust quality system, team of degreed scientists, state of the art laboratory, and our ability to implement standard or custom test methods, makes us a strategic resource for clients in need of litigation support. Relevant services are provided to each client by assuring that we understand the unique background surrounding the case, and our specific role and assignment in the case. Additionally, our compliance with the time-critical demands of litigation, our 24/7 availability to the legal team, and our willingness to adapt to midstream strategy changes offer an additional level of value to our clients.Coupled with the context and content of our work product, skilled communication serves to enhance the effectiveness of the entire legal team. 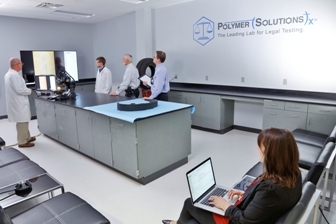 At SGS Polymer Solutions we understand that there is a huge difference between litigation-oriented expert reports and other types of technical publications. We also understand that there is a difference between an academic lecture and legal testimony. We know that a specific communication style is required during a deposition, and a distinctly different communication style is appropriate during a trial. In particular, our polymer, metals, and plastic experts strive to explain the significance of scientific findings in simplified, yet accurate terms. We appreciate the educational diversity of a jury, and have a strong desire to explain case-critical opinions in a compelling, non-condescending manner. SGS PSI has key strengths that are critical for reliable litigation support.